Fuad Zarbiev was at IILJ from 2010-2011 as a Global Research Fellow. He is currently an assistant professor of international law at the Graduate Institute of International and Development Studies in Geneva. He holds an LL.M. from Harvard Law School (2010), a Ph.D in International Law from the Graduate Institute of International Studies in Geneva (2009), the Diploma of the Hague Academy of International Law (2002) and the Diploma on International and Comparative Human Rights Law from the International Institute of Human Rights in Strasbourg (2004). 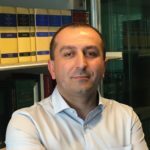 He is the author of various publications in international law journals and books on general international law, theory of international law and human rights. He worked for a number of international-law-related cases in Switzerland and before the European Court of Human Rights. He also served as Legal Advisor to the Costa Rican Government before the International Court of Justice in the Dispute regarding Navigational and Related Rights case. At NYU School of Law he focused on “Judicial Activism in International Law”.